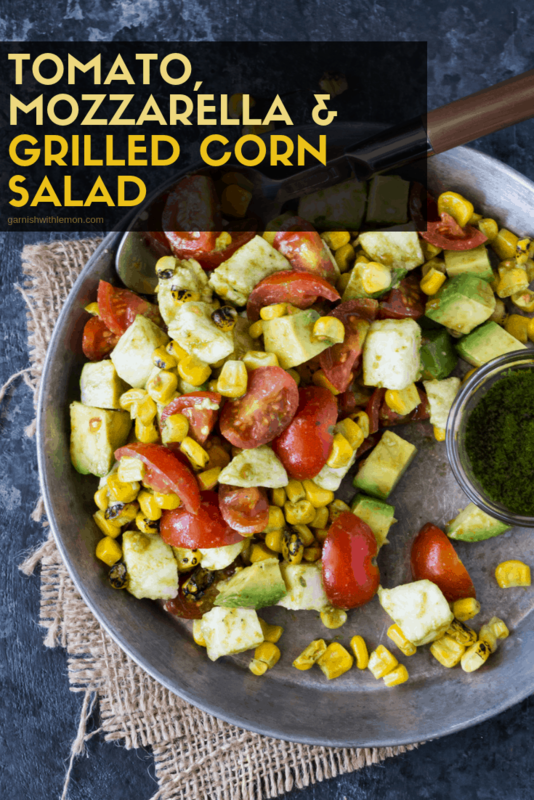 Summer sweet corn and juicy tomatoes join forces with fresh mozzarella and creamy avocado to make this Tomato, Mozzarella and Grilled Corn Salad one of my all-time favorite summer side dishes! Now that the warm weather has officially arrived, my thoughts immediately turn to easy meals, mainly comprised of grilled foods and salads. But not every salad has to be a traditional greens and dressing option. This Tomato, Mozzarella and Grilled Corn Salad is hands-down one of my favorite side salads to gobble down in the summer. 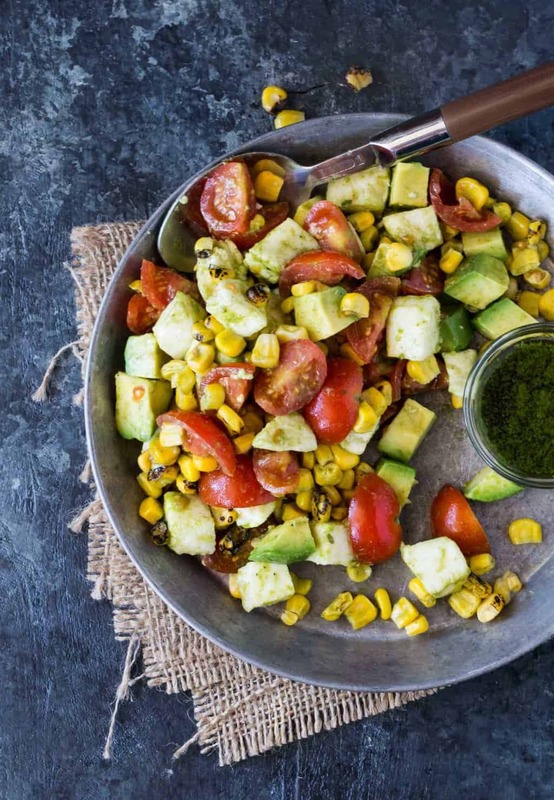 One of my favorite things about this Tomato, Mozzarella and Grilled Corn Salad is that you can find almost all of the ingredients for it during your run to the farmers market. We’re talking tomatoes, corn and cilantro. (Heck, some markets will even have the avocado and fresh mozzarella cheese – a one-stop shop!) I prefer the flavor that grilled corn gives this dish, but feel free to skip that extra step and use fresh corn cut straight off the cob; it will still be delicious. Don’t be put off by the amount of cilantro in the dressing. 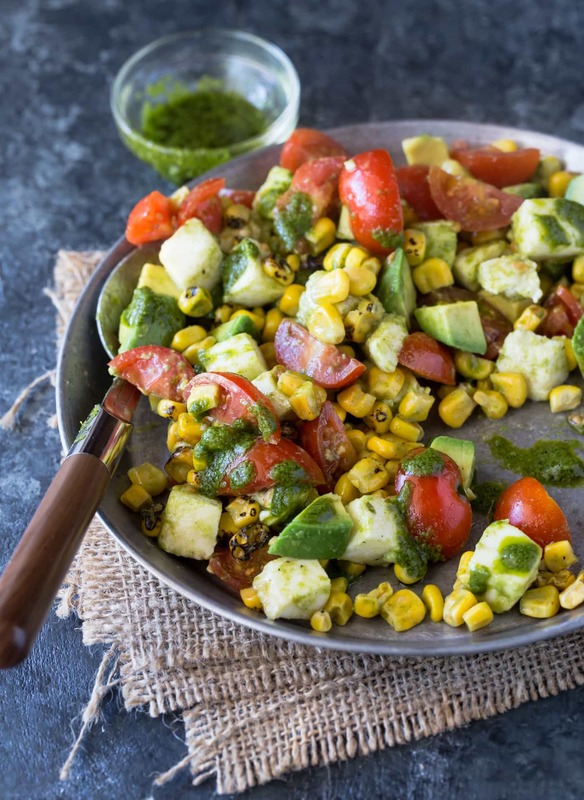 After a quick spin in the blender with lime juice and olive oil, it mellows nicely and is a flavorful complement to the cool avocados, creamy mozzarella, juicy tomatoes and slight char of the sweet corn. Plus the vibrant green color is a show stopper on the buffet table. Tip: Make the dressing in advance and store it in your fridge until you are ready to assemble the salad. Combine all of the dressing ingredients in a blender and blend until dressing is smooth. Add salt (up to 2 teaspoons) and pepper to taste and pulse until combined. Set aside. Preheat grill to medium high heat. Coat corn with olive oil and grill to desired degree of doneness. Allow corn to cool and cut kernels from cobs. 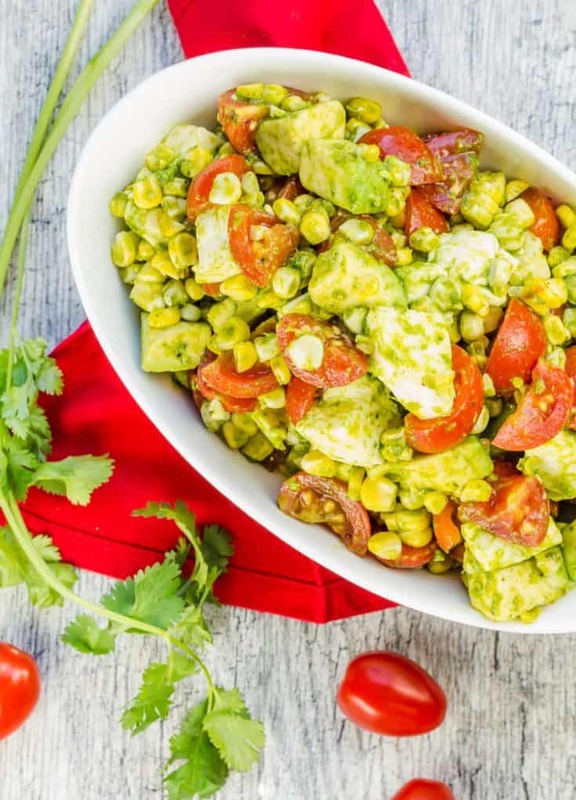 Combine corn, tomatoes, mozzarella and avocado in a large bowl. Drizzle with enough dressing to coat (you may have extra) and gently stir to combine. Chill salad for at least 15 minutes and up to 4 hours before serving. I agree, Laura. Love the cooler nights for sleeping, but so not ready to give up my fresh-from-the-garden produce. Dang this looks good. What’s that delicious looking slab of meat? Hi Karen, The meat was delicious,it’s kabobs marinated in a balsamic vinegar-olive oil marinade. Let me know if you want the recipe! Awww, thanks for the love, Karen! You’ll have to share it with all of your new neighbors after you are settled into your house. Good luck with the rest of the move!